With a big year end party, that was held as it has become customary in Prunesco, and to which all the workers were invited, Christmas and New Year’s Eve were greeted. 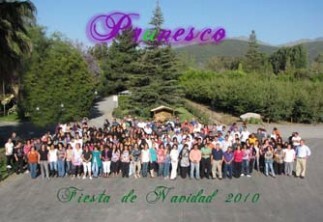 With this celebration the closing of this year 2010 was realized, and which was loaded with very good results. The party, which was attended by over 300 people, had the special participation of the Company’s Chairman Mr. Camilo Pizarro, in addition to Mr. Hector Claro, the General Manager. Workers enjoyed good food, shows and dancing, which undoubtedly strengthens the bonds of the “Prunesco family,” and we can be sure that, being a large number of workers, we are facing the challenges together.